According to market research company The Freedonia Group, Americans spend close to $20 billion on anti-aging products such as supplements and cosmetics to reduce wrinkles, and millions more for other skin-care products. With so many products on the market, it isn’t hard to deduce that people are desperately looking for the products that actually deliver what they promise. While many products are full of ineffective additives, products produced from highly active ingredients, such as Niacin, have repeatedly demonstrated clinically-verifiable results. Niacin, also known as niacinamide and vitamin B3, is one of eight water-soluble B vitamins found in many foods including yeast, meat, fish, milk, eggs, green vegetables, beans, and cereals. Proper metabolism of fats and sugars and the maintenance of healthy cells require Niacin. It plays a major role in ridding the body of toxic and harmful chemicals by increasing capillary dilation, which, in turn, increases circulation. Increased circulation carries nutrients in and toxins out, which is essential to the repair and maintenance of healthy skin. The Nia24 line of skincare products contains Pro-Niacin, a patented molecule that facilitates the delivery of Niacin deep into the skin, where it helps to stimulate DNA repair and build the skin barrier from the inside out. This remarkable molecule also assists in energy metabolism, stimulation of Leptin release and modulation of blood cholesterol levels. Studies show that topical niacin reduces fine lines and wrinkles, red blotchiness and improves skin elasticity and even acne. Niacin can speed up cell metabolism and cell turnover, processes that slow with age, help heal wounds, repair sun damage and hyperpigmentation, and strengthen the skin barrier from the inside out, improving the skin’s ability to retain moisture. With a full line of products, Nia24 addresses every skin need from cleaning, correcting, and moisturizing to repair and protection. 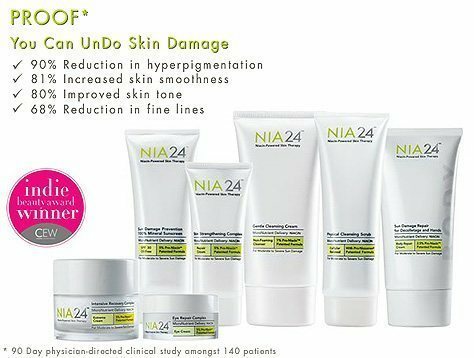 Each product in the Nia24 line contains 5% Pro-Niacin formula to strengthen the skin barrier and visibly improve skin tone, texture and hyperpigmentation. Call Dr. Shapiro’s Skin Klinic (480) 451-1700 for more information on the transformative benefits of the Nia24 line and to find out which Nia24 products will help you get your best skin.